Most haunted locations have death associated with them - that crossing over from this realm to the next, but how those deaths happen is as important as the fact that they passed on there. It appears that the moments that a person is dying, whether in fighting, defending, sickness, suicide or pain, the intensity of emotion and period of time are critical to adding layers in the environment of space "memories" or "markers." Surprise death, such as being shot down without foreknowledge, seems to lessen the possibility of lingering spirits. Considerations such as geology, construction, and decades of tragedy combine into ideal spirit vessels, as well as possibly some other elements we don't consider. 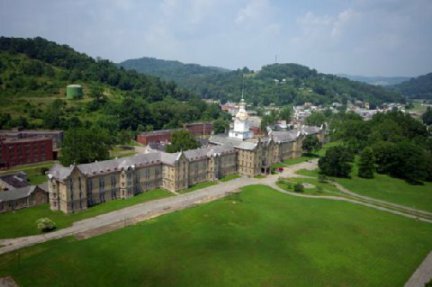 Trans-Allegheny Lunatic Asylum in Weston, WV. An ideal candidate for a spirit vessel. The largest hand-cut stone structure in America sitting atop of sandstone, shale, clay, coal and limestone geology, and has had hundreds of agonizing deaths within its walls, not to mention the energy of many minds that were troubled. The power of the earth is an amazing thing. In fact, Tesla mentioned that the voltage between earth and ionosphere could make for unlimited free energy if we tapped it. The constant geologic shifts and seismic activity affect the human body, but what do certain types of geology do for forces and pressures, fissures, and caves, all sort of variables underground that affect the very chemistry and electrical of our bodies? People do predict earthquakes, most often reporting migraines just before. Animals react quite violently to coming seismic activity. Even solar flares can give us vivid dreams. We are more affected by the very earth we are pressed upon by gravity than we realize. Atmospheric electricity: There are electrical charges in earth's atmosphere. Tesla even contemplated that between the negatively charged earth and positively charged inosophere, there were 200,000 volts available for potential free energy for the citizens. Static electricity and electrical storms are often signs present during haunting activity. Earth's Resonance: The earth vibrates at a resonance of 7.83 Hertz. Some believe that listening to this particular frequency would be soothing to the body and any variances in that frequency may cause unsettling effects. Seismic activity might give off a resonance felt by animals and sometimes interpreted by humans as migraines and odd dreams. It is possible that this resonance change can precede a ghostly activity or make it more perceivable. Harmonics: While researching hauntings at Eastern State Penn, it was found that the long spoke-like halls projecting from the inner circle area created infrasound when there was rain falling on the building. Infrasound is a frequency of sound below the threshold of human hearing, and yet it has a remarkable effect on the person's perceptions and experiences. The very action of wind, rain and natural occurrences upon a building, if constructed a certain way, could create infrasound that, once again, either makes us perceive something that isn't there or makes us more keenly aware of that which we cannot perceive under normal circumstances. Geomagnetic storms: When there are solar flares, the resulting issue for us on the Earth are geomagnetic storms. It's been studied in its affects on heart rhythm and heart attack rates, but what about the brain? The pineal gland is the interesting part of the brain. It is small, like a walnut, but packs a huge punch. It floats in cerebrospinal fluid inside the brain and regulates much from our circadian rhythms, internal compass, and releasing hormones like melatonin that allow us to sleep. It is also believed to be the seat of psychic skills. And, it is apparently affected by geomagnetic storms with everything from higher incidence of suicide to extremely vivid dreams. It is possible that geomagnetic storms either work on our receptive abilities to perceive ghostly activity or affect the phenomena of ghosts to manifest. Water holding memories: Experiments have shown that impressing a word or feeling onto a drop of water causes the very formation of it to change. We have yet to put this test to other sources to see what else holds memories. Being a psychometrist, I can tell you that objects and walls hold memories and even spaces. The question is - might this be just recorded events or memories and not a true spirit haunting feature? Feng Shui: An ancient Chinese system for organizing one's environment to make good energy flow freely and bad energy exit. The very placement of doors, windows, stairwells, and objects within a home can either trap bad energy or allow good energy to make positive things occur. I often ask people in troubled homes to being with some simple steps, journaling events, having a talk with the environment, and cleaning up the clutter and adding more light. It is not fully understood if "chi" (energy) is blocked by paths, but ironically highly reported areas of hauntings are hallways and roadways. Geology: There is a great deal of talk about the types of geology that seem to be present in haunted locations and in my own sample study of 50 reportedly active haunted locations, things like limestone, granite, and sandstone were common, but then these are common geological features in areas where towns were built around mining and resources. It can be hard to decide if the geology is at fault or if the fact that distant buildings were built in prime areas that populations gravitated toward. There are some things to consider in places like mining towns. Yes, they had a rough and tumble past, but so did Gettysburg Battlefield and Revolutionary War locations. The very content of salt and copper in the ground could make some areas more electrically conductive. It might either jump start ghostly activity or create phenomena interpreted as ghostly. Piezoelectricity: Many materials can produce an electrical charge such ceramics, stone and quartz. There are very interesting conditions in ancient megaliths that show promise that the ancients were very aware of the properties of stone and ceramic and resonance and sound waves in order to create all manner of disturbance and perhaps even opening portals to other realms in which they eventually chose to remain and leave us behind with the remnants of a civilization so advanced that we must ponder if aliens had visited us. Psychometrics: Is a prison more haunted because of the amount of angry people within and violence or because it contains metal surfaces that retain that energy? Are ties made in this realm with an energy form that can pass between worlds so that those on the "other side" can come back and forth under the right conditions to the locations that are tied to their personal energy form? Well, there is much to be pondered in this arena and I have spent a lifetime trying to figure out just how psychometrics work and what I am reading and how, though I do admit that metal seems to retain the clearest "memories" to be read. Living humans: There is no denying that, no matter what equipment an investigator carries, it's the human who perceived the activity that is the best meter for what is going on a haunted environment. There are humans who are more "magnetic" for activity and whether that is because their perceptions are better honed or they simply have a chemistry or electrical about their bodies that attracts or even creates the right situation for a showing, is unknown. There have been reported higher incidents of poltergeist activity in those who have seizure disorder and whose temporal lobes might be damaged or highly active. There is much we don't know about how it all comes together, but we do know one thing - humans are witnesses to activity and so a very integral part of the whole process of finding hauntings. As you can see, these are only a part of the potential physical world elements that can contribute to a haunting and even when you put all these together, you don't know the exact balance necessary to create lots of activity. We living people are perhaps one of the greatest elements because it is our very perceptions that register these hauntings and there is very likely an element of our own chemical and brain makeup that affect/attract activity.